Women of Vision is a giving circle at Oklahoma Baptist University that offers a unique opportunity to join other women who desire to create a valuable financial source to support, promote, sustain, and enhance the university’s mission. Women of Vision exists to encourage women to be philanthropic leaders and to maximize the impact of their giving. Through the giving circle, individual contributions are united and magnified through a collective voice supporting the university. Gifts collected from each member are pooled, and together, the Circle members decide how the money should be directed on Bison Hill. Membership is open to alumnae and friends who understand the potential women have in making a significant impact on OBU, her students, programs, faculty, and staff. View a downloadable PDF brochure. To empower women through a collective and influential voice and enable them to make a significant financial contribution to the students, programs, faculty, staff, and mission of Oklahoma Baptist University. Educate women about the exemplary diverse people, innovative programs, and visionary progress at OBU. Enhance programs at OBU through the women's knowledge, talents, skills, and philanthropic ministries. Engage alumnae, friends, and OBU community in enriching academic, social, and spiritual life on Bison Hill. Equip women with resources, opportunities, and challenges that empower them professionally, personally, academically, and spiritually. Encourage women to be influential and distinguished philanthropic leaders at OBU. Enjoy the power, impact, and fulfillment of ‘giving together’ with unified purpose, direction, and realization of goals. Each member contributes $1,000 annually. A special rate of $500 per year is offered to Faculty/Staff (or their spouses), as well as current students and recent graduates (past 5 years) of OBU. The members review a selection of OBU projects that are in need of funds, and each member votes for the project she deems most worthy. Women of Vision will hold an annual event in September to review projects and vote on how to award the money. If attendance is not possible, members may vote by absentee ballot prior to the event. For membership this year, contributions must be received by December 31. The grant is awarded to selected recipient(s). Award(s) will be granted after the Annual Event. Members stay informed about the progress of the funded project and can celebrate the impact achieved by giving together. Celebrate the joy of giving together and the difference it makes. 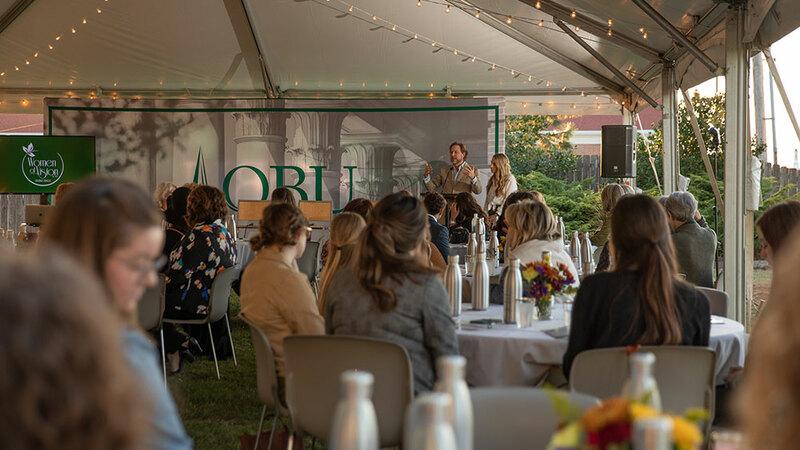 Dozens of women gathered for the Annual Event on Thursday, September 29th, 2018, to celebrate their collective gift of over $85,000 and determine how to direct that gift on Bison Hill. Amy Elaine Martinez, 1991, was the keynote speaker for the event. Her powerful message was entitled “The Unveiling” and reminded us that we can confidently trust in God, even in the unseen. In all, over 100 women joined Women of Vision in 2018, raising the most money to date. The Annual Event serves as the time for members to join together to decide, by vote, which project to fund with their collective gift. It is always a hard decision, and this year was no exception. View the 2018 projects for consideration. The women voted to use their 2018 investment to fund a 3-in-1 project, which includes installing blue phones, purchasing a Bisonmobile, and establishing a WOV endowment. The blue phones were an SGA (Student Government Association) Initiative and include installing safety phones in strategic areas on campus that will automatically connect to emergency services when picked up. The Bisonmobile is an OBU-decaled vehicle that will be used for recruiting events and activities, a fun way to market the OBU name. The Women of Vision endowment will be established to award scholarships to students each year that will impact their ability to experience an OBU education. Though unrelated, these projects are all important and will greatly and positively enhance the OBU experience. In its third year, Women of Vision saw 89 members join together to raise $75,000. Since its inception in 2015, the group has invested nearly $200,000 in the life and mission of Oklahoma Baptist University. The third Annual Event was held on Thursday, September 28, 2017. Jamy Fisher, 1994 OBU alum, delivered a touching keynote address entitled “The New Definition of Greatness," with a stirring reminder about the potential within each of us to make a positive difference. Each year, members gather for the Annual Event to determine, by vote, which project to fund with their collective gift. View the 2017 projects for consideration -- as always, it was a hard decision! After some deliberation, the members cast their votes. The tough decision was affirmed by a close count -- the Campus Ministry Center Renewal project won by just ONE vote! The $75,000 investment from Women of Vision will enable Spiritual Life to offer students space and resources for enhancing meaningful, spiritual encounters. The home of Spiritual Life will be moving from Montgomery Hall to the Geiger Center in the heart of campus. The project will include renovating the area in the Geiger Center, creating offices and a meeting space that will offer more room than the current student lounge in Montgomery Hall. Spiritual Life will still have its own space, but being housed right next to Student Life will offer students a one-stop-shop for most of their campus needs. The actual renovation will not begin until immediately after graduation in May 2018 so as not to disrupt the flow of student activities during this school year. Spiritual Life is the heart of Oklahoma Baptist University. Through the collective gift of Women of Vision, the university is able to emphasize the importance of Campus Ministry and ensure all students are offered a valuable and transformational experience on Bison Hill! In its second year, membership to Women of Vision increased from 58 to 78, and the total collective gift was nearly $70,000 (up over $20,000 from the inaugural year in 2015). The Annual Event was held on September 29th, 2016, when over 50 women joined together for a wonderful time. Brenna Stull, 1990 OBU alum and Women of Vision member, delivered a heartening message about “The Power of the Circle,” a stirring reminder of the meaningful impact we can make by joining together. The Annual Event serves as the crux of the giving circle, where members were tasked with deciding which project to fund with their collective gift. View the 2016 projects for consideration – all worthy projects. After hearing about each of the needs, the members voted to fund the ‘Keyless Card Access’ project, which won with the majority of the votes. This project, combined with the project funded last year – adding more campus lighting - speaks volumes to the women’s desire to enhance and impact the safety/security of a student’s experience on Bison Hill, as well as OBU faculty, staff, and visitors. The total cost of the project was estimated to be just over $71,000. The collective gift from Women of Vision 2016, about $70,000, is enough to underwrite the majority of the expenses. All dormitories are already equipped with keyless card access technology, so the project will include all other major buildings that lack it – Ford Music Hall, the Art Building, the Art Annex, Wood Science, Thurmond Hall, Mabee Learning Center, Shawnee Hall, and parts of the Geiger Center. This technology will enhance safety and security for our students, faculty, and staff, insuring access to only those with permission. It also gives the university the ability to lock the buildings electronically. To be certain, the investment Women of Vision has already made is significant and will meaningfully impact the work of our great university. In just our first two years, Women of Vision has equipped the university to substantially increase security through additional campus lighting and enhanced technology for building entries/exits. By giving together, we have accomplished so much more! Women of Vision launched in 2015, and the inaugural year saw lots of work – brainstorming, planning, marketing, etc. With an outstanding Advisory Council established, the group surpassed its base goal of 50 women and celebrated a total of 58 charter members! In all, almost $47,000 was gifted. The first Annual Event for Women of Vision was on September 24th, 2015 – a time to gather as members, review projects in need of funds, and decide how to award the collective funding. It also served as the time to meet other members, fellowship together, and just have a really good time. The 2015 Annual Event was a wonderful time when many women, who share similar visions and values, come together. Ronda Mikles, 1975 OBU alum and a Women of Vision Advisory Council member, delivered an inspiring and encouraging message about the power there is in working, serving, and simply DOING together. The members also had the opportunity to hear about the projects on the ballot and then decide how to direct the generous financial gift given by the group. View the 2015 projects for consideration – all very worthy of the WOV funds. The 58 member votes were evenly spread across the board, and the project that was chosen – Additional Campus Lighting – won by only a few votes. Because of Women of Vision and the $47,000 that was given, approximately 25 additional lighting fixtures will soon be installed on campus as part of phase one of the OBU campus lighting improvement plan. See what types of lights will be installed and where. You will note the majority of the Sternberg, 12-foot light poles will be installed around WMU, Kerr, and Montgomery Hall, adding much-needed lighting near student dorms. Three additional mast street lights will be added to University drive, enhancing the lighting of the main street through campus, and about a dozen of the smaller, bollard lights will be installed along the walkway between Sarkeys and Shawnee Hall. Providentially, the morning of our 2015 Annual Event for Women of Vision, Dr. Whitlock and the OBU administration were petitioned by student body leaders for additional campus lighting. Based on concerns from these students and in conjunction with facilities management, lighting in the areas mentioned above is a necessity. The total cost for this project is around $65,000. The financial gift through Women of Vision will help offset OBU’s investment, allowing the university to provide our student body more peace of mind through the added safety and security, not to mention the improvement it will make to the overall look and feel of our already beautiful campus! Membership requires a commitment of $1,000 per year. A special rate of $500 per year is offered to Faculty/Staff (or their spouses), as well as current students and recent graduates (past 5 years) of OBU. Acceptable gifts for membership include: cash, checks, credit card payments, and securities. Gifts can be fulfilled through a one-time contribution or through pledge made in payments. OBU faculty and staff members may use payroll deduction to fulfill their pledge. Giving a membership is a great way to connect women with others who desire to support the mission of Oklahoma Baptist University. ‘Women of Vision’ provides them with exposure to wonderful resources, relationships, and experiences, as well as the opportunity to instill within them a sense of community and the importance of philanthropy. For questions or more information, please contact Gretchen Trimble at 405-585-5426 or gretchen.trimble@okbu.edu. Sign up for Women of Vision today!